North of the veterans' camp, the Eternal Light Peace Memorial was unveiled during the reunion. 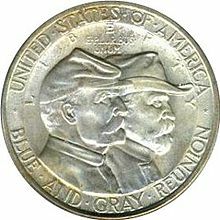 To raise reunion funds, in June 1936 Congress authorized 50,000 US Mint commemorative half dollars (obverse shown above)—each was dated 1936 despite being struck in 1937. Sculptor Frank Vittor had used Union veteran James Power Stanley of the Battles of the Wilderness, Cold Harbor, North Anna, and Spotsylvania for the model, A special US postage stamp was also advocated for the reunion's opening day. Unsold coins were destroyed. The 1938 Gettysburg reunion was an encampment of American Civil War veterans on the Gettysburg Battlefield for the 75th anniversary of the Battle of Gettysburg. The gathering included approximately 25 veterans of the battle:72 with a further 1,359 Federal and 486 Confederate attendees out of the 8,000 living veterans of the war. The veterans averaged 94 years of age. Transportation, quarters, and subsistence was federally funded for each veteran and their accompanying attendant. If an attendant was needed it was provided. President Franklin D. Roosevelt's July 3 reunion address preceded the unveiling of the Eternal Light Peace Memorial; a newsreel with part of the address was included in the Westinghouse Time Capsule for the 1939 New York World's Fair. The reunion's support personnel included 19 officers and 250 enlisted men of the Pennsylvania National Guard, and there were 3,185 United States Army personnel in total. A "regular army camp" that displayed modern weapons was east of the northward tracks of the Reading Railroad to the Gettysburg College buildings,:64–5 while the Third Corps headquarters tent was south of Gettysburg near The Angle. There were 548 police; from the Pennsylvania State Police and officers from New York City, Philadelphia, and Pittsburgh; and a Gettysburg College building was the "base hospital" under the First Regular Army Medical Regiment. 1936: The House Military Affairs Committee recommended the Haines Bill for forming a federal committee to work with the Pennsylvania reunion commission. 1937 February 6: The first joint meeting of the federal and Pennsylvania state commissions. 1937 May 8: The Pennsylvania reunion commission's headquarters at the Hotel Gettysburg annex began selling the "Gettysburg commemorative half dollars" for $1.65; the hotel and two Gettysburg banks also sold the coins. January 15: The navy sent the 75-man Marine Corps Band for the reunion (4 other bands were also at the camp). February: Gettysburg, Pennsylvania, formed a 9-person committee for the reunion. April 18: The Works Progress Administration began improvements to the 25 sq mi (65 km2) of the Gettysburg National Military Park. April 26: Veterans' camp construction began at the "north end of Gettysburg College and on adjacent private property". :52 The Civilian Conservation Corps (CCC) on Seminary Ridge provided manpower for building the veterans camp, and about 50 enrollees at CCC camp MP-2 of Company #1355-C served as guides for the veterans. May 16: President Franklin D. Roosevelt signed the bill for the federal transportation and camp appropriations of $900,000 (federal memorial funding had also failed in 1912). June 25: The 1st Medical Regiment arrived from Carlisle Barracks, Pennsylvania to provide medical care for the reunion. June 29: Twelve special Pullman trains arrived carrying veterans (4 from the east, with the remainder from the north and west). July 1, Friday (Reunion Day): Opening ceremonies in the Gettysburg College Stadium were in the morning and included an address by Secretary of War Harry Hines Woodring, chairman of the United States Commission. - The 3-mile-long parade for 2 1/2 hours was between the reviewing stand in the college stadium and the intersection of the Baltimore Pike and the Emmitsburg Road, through the Lincoln Square; and included three groups: distinguished visitors first, followed by U. S. Army units and equipment, and nmore than 50 drum and bugle corps. - A Marine Corps Band concert was held in the Gettysburg College stadium (the only remaining Jewish Civil War veteran, Daniel Harris, was a guest on the platform). - Veterans shook hands across the stone wall at The Angle as during the 1913 Gettysburg reunion. - As Roosevelt's 9 minute address ended at sunset, the Peace Memorial covered by a 50 foot flag was unveiled by George N. Lockwood and Confederate A. G. Harris (both age 91) with 2 regular army attendants. - Army aircraft staged a simulated air raid on Gettysburg at dusk, and searchlights were directed from the ground at the planes while they dropped flares. - Fireworks were launched from the crest of Oak hill. July 5: The 62nd Coastal Artillery departed for Fort Totten, the 12th Infantry (without 1 company) to Fort Howard (Maryland), and the Third Cavalry to Fort Myer. July 6: The 66th Infantry departed for Fort Meade and the 6th Field Artillery to Fort Hoyle. July 7: The 34th Infantry (without 1 company) departed for Fort Meade. September 23: A World's Fair time capsule with a "permanent acetate film by RKO-Pathé" (15 minute newsreel) with part of Roosevelt's Gettysburg reunion address and numerous other events was lowered into a 50 ft well. ^ a b c "Gettysburg Celebration to be Attended by 3,500 Vets". The Daily Times. June 11, 1938. Retrieved February 8, 2011. ^ "Blue and Gray Reunion". Schenectady Gazette. June 14, 1938. Retrieved November 26, 2016 – via Google News Archive Search. ^ a b "Reunion Coins On Sale Here". Gettysburg Compiler. May 8, 1937. Retrieved February 9, 2011. ^ a b "Battle of Gettysburg Half Dollar". CoinSite.com. Archived from the original on 2010-12-14. Retrieved 2011-02-09. ^ "Veteran Poses for Commemorative Coin". Prescott Evening Courier. May 24, 1938. Retrieved February 10, 2011. ^ "Public Thinks". The Modesto Bee. February 16, 1938. Retrieved February 9, 2011. ^ Ed Rochette (November 25, 1984). "Citizens in battle to save the sanctity of Gettysburg". Coin Roundup. The Vindicator. Retrieved November 26, 2016 – via Google News Archive Search. ^ a b c d e Cohen, Stan B (1982). Hands Across the Wall. Charleston, West Virginia: Pictorial Histories Pub. Co.
p. 64 NOTE: The overhead camp image shows tents south of Howard Av and west of the Biglerville Rd beyond the Mummasburg Rd to the former Reading Railroad line which extended northward from the rail "+" intersection (bottom left of photo) before the northward railway was moved westward circa 1939 when the Round Top Branch was removed. p. 75 NOTE: The image of tanks side-by side has the 1888 Glatfelter Hall behind at a distance and an angle which places the tanks to the southwest, nearly on the current location of a portion of Constitution Av. ^ a b Salmon, John S (2007). Historic Photos of Gettysburg. Turner Publishing Company. ISBN 978-1-59652-323-4. LCCN 2006937078. Retrieved February 10, 2011 – via Google Books. ^ "Anniversary Reunions of Civil War Veterans". GSA.gov. Retrieved February 9, 2011. ^ "Veterans Reunion At Gettysburg Closes Monday". Eugene Register-Guard. July 5, 1938. Retrieved February 9, 2011. ^ a b NOTE: The following news article's numbers for reservations are italicized in the table: "TWO VETERANS OF CIVIL WAR CLASP HANDS". St. Petersburg Times. June 28, 1938. Retrieved February 9, 2011. ^ "Blue and Gray Meet". The Cambridge City Tribune. July 14, 1938. Retrieved February 9, 2011. ^ a b c "Here and There: ...four-star peak of Big Things that came to Gettysburg..." Gettysburg Times. Times and News Publishing Company. April 21, 1944. Retrieved February 9, 2011. ^ "Woodring, Earle speak At Veterans' Reunion". Reading Eagle. July 1, 1938. Retrieved February 10, 2011. the headquarter's tent of Major General James K. Parsons, of the Third Corps area, pitched within easy pistol shot of that bloody angle where Pickett's men notched the extreme advance of the battle. ^ "Gettysburg's Last Reunion Days End". The Pittsburgh Press. July 5, 1938. Retrieved February 8, 2011. ^ "Senator Rice Sponsors Bill for Gettysburg Peace Memorial". Gettysburg Compiler. January 20, 1937. Retrieved February 10, 2011. ^ "House Group Approves U. S. Reunion Aid". Gettysburg Times. Times and News Publishing Company. April 10, 1935. Retrieved February 9, 2011. ^ a b "Measure Calls for Creation of $100,000 Fund; Eternal Light To Be Built on Battlefield and Dedicated at Anniversary and Reunion in 1938" & "'1938' Banquet is Postponed". The Star and Sentinel. January 30, 1937. Retrieved February 10, 2011. ^ "Marine Band to Play Here". The Star and Sentinel. January 15, 1938. Retrieved February 9, 2011. ^ "9 Citizens Will Arrange Town's Reunion Plans". The Star and Sentinel. February 6, 1938. Retrieved July 2, 2018 – via Google News Archive Search. 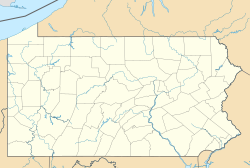 ^ "Gettysburg Area to be Renovated for Reunion". Lawrence Journal-World. April 18, 1938. Retrieved July 2, 2018 – via Google News Archive Search. ^ Nagle, George F. "Research Project-CCC Camps". Afrolumens.org. Archived from the original on September 22, 2007. Retrieved June 1, 2010. ^ At Work in Penn's Woods: The Civilian Conservation Corps in Pennsylvania. Penn State Press. ISBN 0271047372. Retrieved March 20, 2011. ^ "Blue and Gray reunion at Gettysburg, PA, June 29 - July 6, 1938" (PDF). Army Medical Bulletin, 1922-1949 (46): 29–38. Retrieved July 2, 2018. ^ "Plans Completed for Gettysburg's Big Celebration". The Daily Times. June 28, 1938. Retrieved July 2, 2018 – via Google News Archive Search. ^ "Local News". New Oxford Item. June 23, 1938. Retrieved July 2, 2018 – via Google News Archive Search. ^ "Blue, Gray Veterans Gather At Gettysburg for Reunion". Reading Eagle. June 29, 1938. Retrieved February 9, 2011. ^ "Gray And Blue Reunion Temp Quickens For Second Day". The Miami News. July 2, 1938. Retrieved February 10, 2011. ^ a b c d e f "President Roosevelt Dedicates Eternal Light Peace Memorial to Cause of Peace Before 200,000 as Climax to 75th Anniversary of Civil War Battle". Star and Sentinel. July 9, 2010. Retrieved February 8, 2011. ^ "Peace Eternal in a Nation United". Virtual Tour - Day One: Oak Hill. NPS.gov. Retrieved February 9, 2011. ^ "Roosevelt Dedicates Peace Shrine". The Evening Independent. July 4, 1938. Retrieved July 2, 2018 – via Google News Archive Search. ^ "Flame Burning on Monument at Gettysburg". The Telegraph Herald. July 4, 1938. Retrieved February 8, 2011. ^ "Flags, Bunting Brighten Town for Battle Fete". Gettysburg Times. June 23, 1938. Retrieved July 2, 2018 – via Google News Archive Search. ^ "Aged Veterans Gather on Gettysburg Field". The Bulletin. June 21, 1938. Retrieved July 2, 2018 – via Google News Archive Search. ^ "Veterans Depart from Gettysburg Field After Colorful Reunion". Reading Eagle. Retrieved July 2, 2018 – via Google News Archive Search. ^ "A Picture of Today for a World 5000 Years Away" (Paperspast webpage). The Saturday Evening Post. Vol. CXXVI no. 116. November 12, 1938. p. 28. Retrieved February 9, 2011. ^ "Capsule Contents". DavidSZond.com. Archived from the original on 2010-11-21. Retrieved 2011-02-09. ^ "Back in Those Days..." Gettysburg Times. April 26, 2001. Retrieved July 2, 2018 – via Google News Archive Search.